This scenario is a bit more challenging than my Georgia scenario. Again, I used Ampz's Mapgen 1.3 tool to convert a topography map from the National Geophysical Data Center (http://www.ngdc.noaa.gov/seg/topo/state.shtml) into a locomotion landscape. 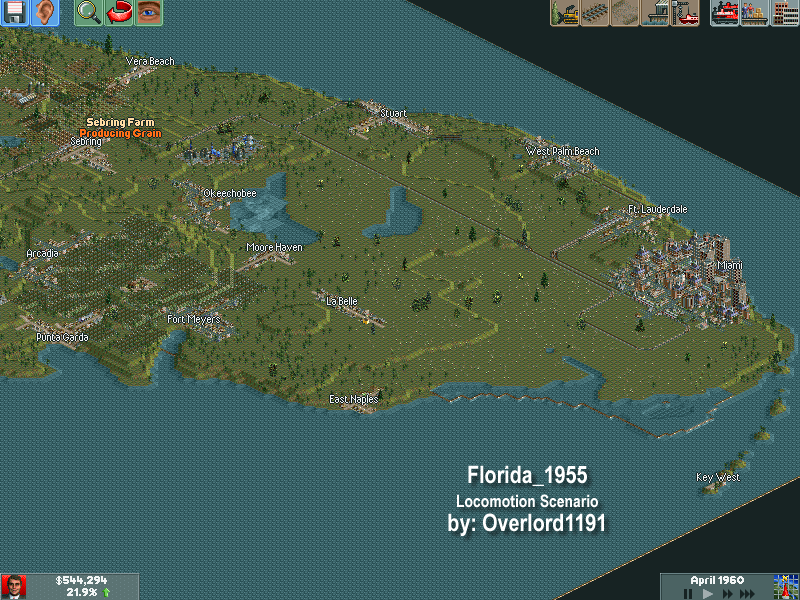 Then I added the cities based on actual cities in Florida and I tried to keep the industries somewhat in the actual regions while still keeping the scenario playable and fun. The Goals in this scenario are simple. Keep the tourists (passengers) moving. Move 800,000 passengers to win. Sounds easy huh? Well this map isn\'t exactly flat and because Florida is narrow most of the cities are crammed into a few overpopulated areas. Oh and the AI are challenging you everywere you go. Hints: Use the offshore oil rigs and chemical plants to support your finances. You are going to need aircraft to really move the people around the map and planes cost money. Lots of money.